All Reed cutter wheels are made from high shock-resistant tool steel, while competitive cutter wheels are made from carbon steel or still lower quality tool steel. By using this higher quality raw material, Reed cutter wheels can be made thinner and can therefore cut pipe more easily and leave less burr. Also, because of their higher quality, certified material, only Reed cutter wheels can be heat-treated for the perfect balance between hardness and toughness to make Reed cutter wheels resist breakage and last longer. Reed pioneered the development of cutter wheels for plastic pipe and today has the widest variety and highest quality cutter wheels for various types and wall thicknesses of plastic pipe and tubing. 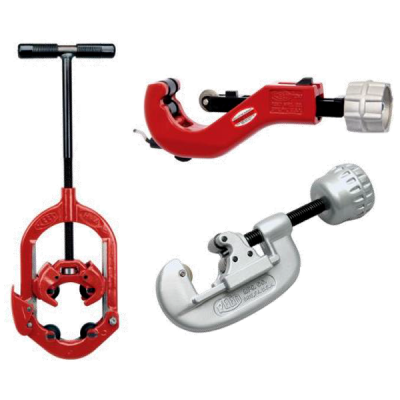 Reed offers the largest cutter wheel line for all types of pipe, tubing and conduit. Reed cutter wheels are the best value for use in Reed cutters, or in the cutters of any other manufacturer.